Make 2018 your year to have the best lawn. We carry everything you need to get the grass beautiful and green. For those of you that are too busy this year we can also recommend a landscaper to get the job done. So you want to know the secret to a beautiful lawn? It's not a new engineered fertilizer that sends a signal to your iPhone to turn the sprinklers on automatically at exactly the right hour. It's LIMESTONE. Yes, limestone is the secret. Limestone contains 2 essential ingredients that plants need; calcium and magnesium. Lawns get stressed and turn brown, go dormant, or even die. You can reduce the stress of your lawn by applying lime twice a year. Limestone raises the pH therefore reducing the pH stress on the lawn. Acid rain, decomposed grass, leaves, and that fancy fertilizer you are putting down reduce your soil's pH. Don't be stingy either. The recommended application is 1 bag per 1,000 sq foot per year. Yes, it's a lot of lime. Consider this; you can buy about 7 bags of lime for every 1 bag of fertilizer. So while it may weigh down the back of your Honda CR V, it won't put a big dent in that wallet. The results will amaze you. Your lawn will turn green faster and it will be more likely to tolerate whatever stresses 2018 decides to give us. Spend a dime. Buy Conklin Lime! 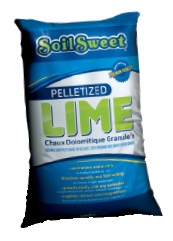 Soil Sweet Pelletized Lime 40 lb bag Covers 1,000 sq ft per year Perfect for a rotary spreader. As Fred says; "You can lime your lawn in a suit and tie." Conklin Limestone's Lawn & Garden Calcitic Powdered Limestone 50 lb bag covers 1,000 sq ft per year. Requires drop spreader. "The good stuff"
Solu-Cal Concentrated Limestone Each bag covers 4,000-8,000 sq ft Pelletized a little more pricier in cost, but make that up in savings of labor.